Conservative governor Annegret Kramp-Karrenbauer's popularity appeared to have trumped what has become known as the Schulz effect. BERLIN: Chancellor Angela Merkel's conservative party easily won an election in Germany's western Saarland state on Sunday, an unexpectedly strong performance as Merkel prepares to seek a fourth term in a national vote later this year. The outcome was disappointing for her center-left rivals, the Social Democrats, in their first electoral test since nominating Martin Schulz in January as Merkel's rival for the chancellery. The party, which saw a boost in poll ratings with Schulz's nomination, fell far short of its hoped-for first place finish and won too little support for a new left-wing government in the region of nearly 1 million people on the French border. Conservative governor Annegret Kramp-Karrenbauer's popularity appeared to have trumped what has become known as the "Schulz effect." "In uncertain times, people trust the political force that governs reliably," said Peter Tauber, the general secretary of Merkel's Christian Democratic Union. "The CDU is the only political force that distanced itself clearly from working with the populists of left and right." The CDU polled 40.7 percent in the election for Saarland's state legislature. The Social Democrats received 29.6 percent of the vote. Saarland is currently run by a "grand coalition" of the conservatives and Social Democrats, similar to Merkel's governing alliance in Berlin. Sunday's result means no other coalition is politically feasible. Pre-election polls suggested a significantly tighter race. They pointed to the possibility of a Social Democrat-led government with the opposition Left Party — a prospect that may have turned off some voters. The Left Party, born from the merger a decade ago of ex-communists with other left-wingers and relatively strong in Saarland, won 12.9 percent. The left-leaning Greens dropped out of the state legislature, falling short of the 5 percent needed to keep their seats. The nationalist Alternative for Germany, or AfD, won 6.2 percent of the vote. That means it is now represented in 11 of Germany's 16 state parliaments, but Sunday's result was far short of the party's double-digit showings elsewhere last year. AfD rode discontent over the influx of migrants to Germany in 2015 and 2016, but that issue has faded somewhat from headlines and the party has suffered from infighting. No other party wants to work with it. 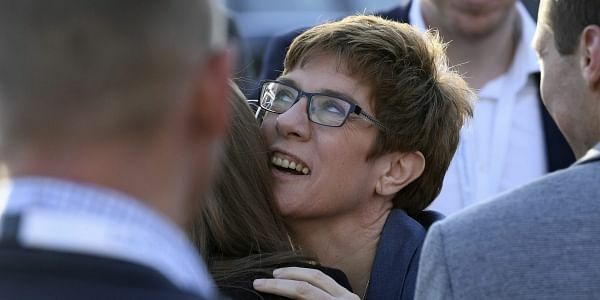 Kramp-Karrenbauer is one of only five conservative state governors, and her party's showing was up from 35.2 percent in Saarland's 2012 election. The Social Democrats dipped from 30.6 percent, while turnout rose to 69.7 from 61.6 percent. A loss for Kramp-Karrenbauer would have been a worrying signal for the CDU's national campaign and for two bigger state elections in May — in Schleswig-Holstein and Germany's most populous state, North Rhine-Westphalia, both now led by the Social Democrats. The national election will be held on Sept. 24. "This is a great start to the election year 2017," said Michael Grosse-Broemer, the CDU's chief whip in Berlin. Schulz, a former European Parliament president but a newcomer to national politics, has boosted his party's long-moribund poll ratings and injected it with new self-confidence. He is offering a classic, though often vague, center-left pitch of tackling economic inequality at home. Schulz conceded that the Social Democrats' performance fell short of his expectations, but said it wouldn't deflect the party from its goal and told supporters to "look ahead with confidence." "Our goal is to achieve a change of government in the federal republic (of Germany)," he said. "And there has been a clear message to us this evening: this is a long-distance race, not a sprint." His party's general secretary, Katarina Barley, said it was polling only 24 percent in Saarland before Schulz entered the scene. "The Schulz effect does exist, and it's a long way to the national election," she said.